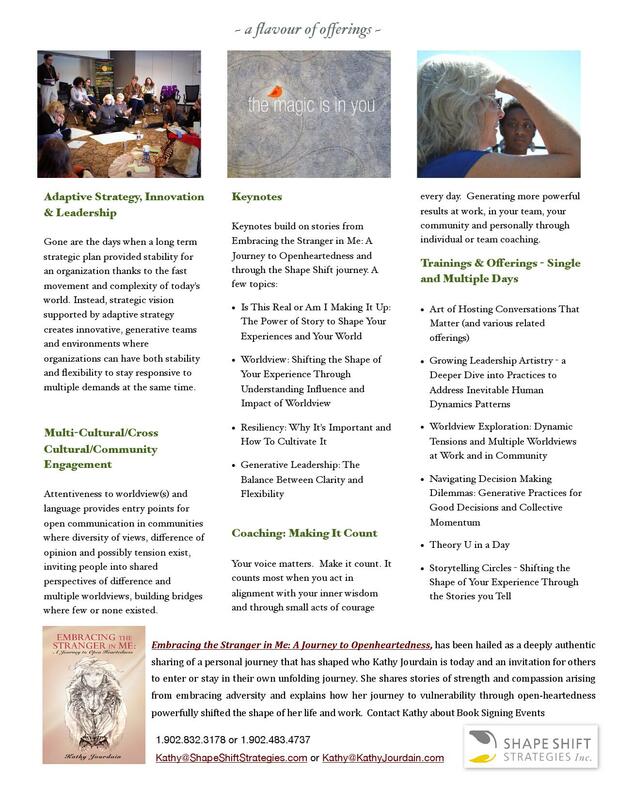 Kathy Jourdain is a co-developer of the Worldview Intelligence(TM) programs, offerings and curriculum with Jerry Nagel, PhD, consulting with senior leadership, executive and management teams in a broad range of organizations and communities. She holds a long view vision for the work and has been co-evolving it through research and practical application. She has a passion for co-creative leadership and the ability to influence the shifting shape of organizations, teams and individuals in a time when this is most needed in the world. Kathy launched Shape Shift Strategies Inc. in 2009, the third launch of her consulting practice since 1998, as the shape of her own life shifted yet again. 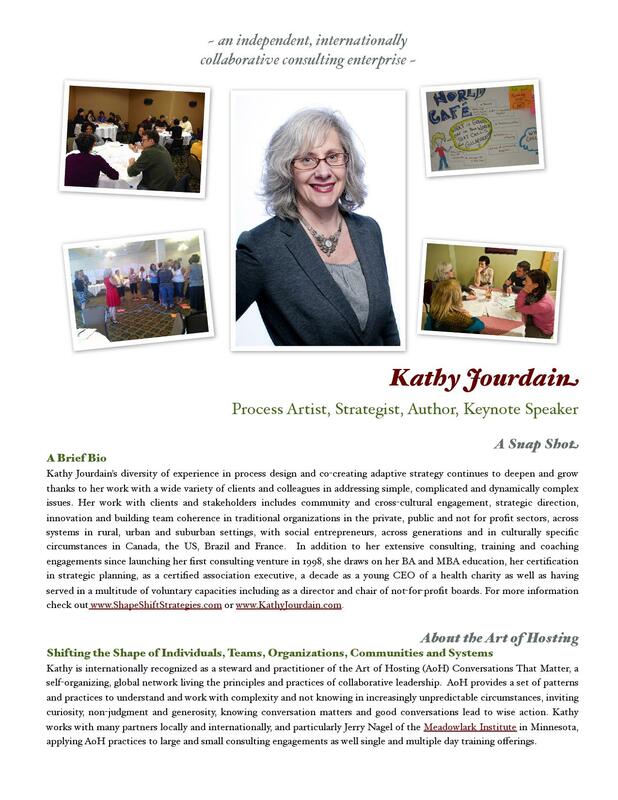 Kathy is a steward and practitioner of the Art of Hosting Conversations That Matter which has her traveling internationally, most often to the United States and Brazil from her home in Bedford, Nova Scotia. She is involved in a broad scope of work giving her a diversity of experience in process design and co-creating adaptive strategy. Her expertise continues to deepen and grow thanks to her work with a wide variety of clients and colleagues in addressing simple, complicated and dynamically complex issues. Her work with clients and stakeholders includes community and cross-cultural engagement, strategic direction, innovation and building team coherence in traditional organizations in the private, public and not for profit sectors, across systems in rural, urban and suburban settings, with social entrepreneurs, across generations and in culturally specific circumstances in Canada, the US, Brazil and France. She is sought after to help develop capacity in different regions and to support newer practitioners in growing their capacity and capability, especially, but not exclusively, younger generations. She is a prolific writer sharing her experience and learning widely with the global AoH community and others. Her first book, Embracing the Stranger in Me: A Journey to Openheartedness was published in 2013. It has been hailed as a deeply authentic sharing of a personal journey that has shaped who she is today and an invitation for others to enter or stay in their own unfolding journey. Her coaching, in person workshops and online offerings are increasing as a direct result of readers sharing the impact the book has had on them. She is well known for her expertise in customized leadership development, building team capacity and working with large scale, long term strategic and systemic change. Her approachable, professional style has made her a powerful business coach with an impressive track record, drawing on skills and expertise developed and deepened during her 15 year consulting practice and before that as a CEO of a major health charity in Atlantic Canada. Keynotes draw from both work and life experiences including from her book. 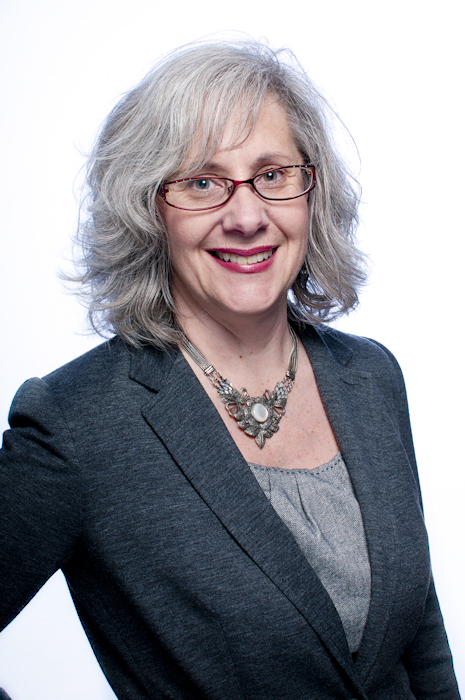 Kathy was a driving force behind Envision Halifax: a voluntary organization whose mission is to ignite a culture of civic engagement where she co-designed and co-facilitated the leadership development program and where her leadership was recognized in 2009. She is certified in Strategic Planning and Strategic Change Management through the International Centre for Strategic Management headquartered in San Diego, CA. She holds an MBA from Saint Mary’s University in Halifax, Nova Scotia and she is a graduate of the Banff Centre for Management’s Executive Leadership Program. As CEO of the Atlantic Division of a major health charity, she streamlined their internal systems. During her not-for-profit career, she was a member of the Canadian Society of Association Executives (C.S.A.E. ), and was on both the local and national boards. She earned the designation of Certified Association Executive (C.A.E.). Her outstanding leadership and contribution in the not-for-profit sector were recognized with local and national awards.